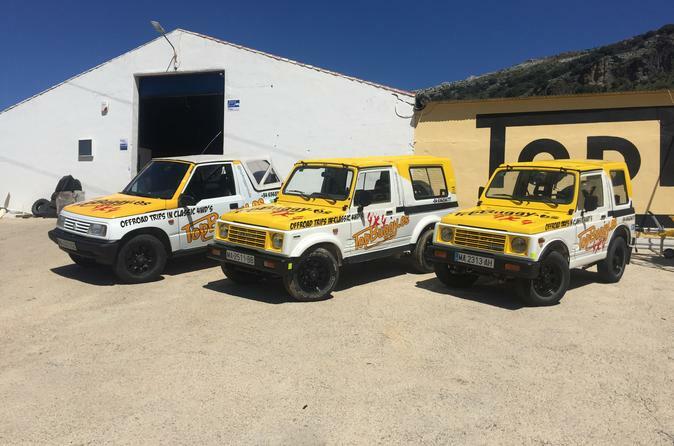 Get behind the wheel of a vintage, 4WD Suzuki for a 3.5 to 4 hour tour of Ronda’s vineyards and wineries. With a guide vehicle to lead the way, you’ll follow dirt tracks and country roads to a series of wineries for drinks and Spanish tapas, and explore a scenic region that’s far from the beaten path. Make your way to a centrally-located meeting point in Ronda where this tour begins, then slide into a classic, manual-transmission Suzuki Samurai 4WD. You’ll cover roughly 40 miles (60 km) of terrain on this winery tour, including a trip to the bottom of the gorge to see Ronda’s soaring, historic bridge. Your guide will capture the entire experience by GoPro, and the footage will be available for download free of charge. In summer months, you’ll be driving an open top vehicle, and a hard top keeps you warm and dry in the winter. The challenging terrain is a good fit for any skill level, and some sections of the loop drive use a historic trade trade route through the countryside. Wines have been produced in the region since the Roman era, but in recent years Ronda wines have been getting global attention, from Chinchilla to Excelencia, Los Aguilares, and Conrad. Take a break from driving to relax at a series of local wineries—wine tastings and snacks are included at each stop. This tour concludes at your starting point in Ronda. Note: Pricing is per vehicle, based on four people per car.